Leona C.Otte, 83, of Surprise, Nebraska, died Thursday, June 29, 2017, at the Ridgewood Rehabilitation and Care Center in Seward. Memorial Service Monday, July 3, 2017 2:00 P.M.
Visitation from Noon - 2P.M. 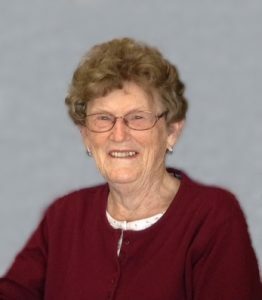 Leona C. Otte was born December 26, 1933, near Rising City to Henry and Clara (Struebing) Prigge. On December 24, 1955, she married Reinhold Otte in Gresham. They lived and farmed near Gresham until 1960 when they move to Surprise where they have lived since. Leona was a member of St. John's Ladies Aid and was very active in her church. She loved playing the piano, tending to her garden and flowers, raising chickens and canning as well as sewing and making crafts. She enjoyed nothing more than time spent with family. Leona is survived by her husband, Reinhold of Surprise, one son Timothy Otte of Seward, two daughters; Teresa Otte of David City, Bonnie (Roger) Topil of Rising City and two granddaughters; Kimberly (Andrew) Lewis of Martell and Kristy Topil of Lincoln, two brothers; John Prigge of Ulysses and Ernest (Barb) Prigge of Boise, Idaho and two sisters-in-law; Marlene Prigge of Overland Park, Kansas and Muriel Standridge of Mesa, Arizona. She was preceded in death by her parents, two brothers; Norman and Ivan Prigge, one sister, Eleanora (Wilbert) Hohndorf and a sister-in-law, Clysta Prigge.